"Paradise is a place with many exits..."
La Vall�e will be principally recognized by fans of the rock group, Pink Floyd, from the revered Obscured by Clouds soundtrack, the group's immediate precursor to their landmark Dark Side of the Moon album. While Michelangelo Antonioni had the band contribute to Zabriskie Point (1970), and David Elfick utilized the signature track Echoes from their Meddle LP for his 1972 documentary, Crystal Voyageur, Barbet Schroeder (Barfly) holds the distinction of being the only director to commission the band for the entirety of his scores, first on 1969's More, and then this, its follow up. Like the subject of its title, the film itself has remained in relative obscurity for decades. 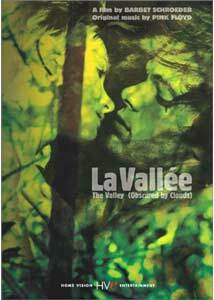 A product of the philosophies the hippie movement of the late 1960s, La Vall�e's 1972 theatrical release coincided with a shift away from these social ideologies, and was seen as dated and out of fashion by the time it was released in the U.S. some seven years later as The Valley (Obscured by Clouds). Still, the movie has been sought out by Floyd fans like myself to see the music in context, and here that search is finally at an end, as Home Vision presents the film in a director-approved, widescreen transfer on DVD. Viviane (Bulle Ogier, The Discreet Charm of the Bourgeoisie), the wife of a French diplomat, is in New Guinea buying native art and local curios for a boutique in Paris; her particular interest, rare feathers. She meets Olivier (Michael Gothard), who shows her the striking plumage of the Bird of Paradise, an illegal prize collected during his expedition deep into the country's rain forests with his band of hippie friends, led by Gaetan (Jean-Pierre Kalfon). They are seeking their spiritual and sexual truths in the mythic "valley of the gods," an uncharted region shrouded from view by mists, and denoted on the maps only as "obscured by clouds." After unsuccessfully trying to convince the group to collect feathers for her to sell, Viviane agrees to accompany them into the back country, apprehensive of their unconventional lifestyle, which contrasts sharply with her own moral and ethical sensibilities. But when her hopes of procuring the illicit treasures are fulfilled by an aborigine magician, she begins a transformation, and to question the validity of the society she's been conditioned to. After joining her companion's quest for total enlightenment, they travel further and further from the civilized world. There is no turning back despite the consequences; their challenge of achieving a true openness paramount, they press on towards the sacred valley that beckons them. Shot on location in Papua, New Guinea, the imagery and settings are spectacular. Academy Award®-winning cinematographer, N�stor Almendros, a staple on Rohmer and Truffaut films, uses the Techniscope framing to excellent advantage in capturing the primal and treacherous landscapes. The film is hued in the atmosphere of the rain forest, and rich in native culture. The haunting masks of the mudmen, and the tribal costuming of the Mapuga are unforgettable. Much like Nicholas Roeg's Walkabout, La Vall�e is all about the journey. One's relationship with one's culture, the concept of innocence, and the aspirations of attaining paradise on Earth play central roles in the adventure, but are left somewhat ambiguous. As the travelers move towards the primitivism of their hosts, the contrast and parallels with the society they have forsaken becomes increasingly evident. While it encompasses the hippie idealism with its search for inner peace, uninhibited lifestyle and sexual freedoms, Schroeder manages to avoid being overly indulgent or exploitive in the presentation. For the most part, the actions of the characters are viewed objectively, such as Viviane's head trip after drinking a native elixir, which doesn't resort to the psychedelic visuals common to earlier films. The frank and candid segment with the Mapuga tribesmen displays their ceremonial rituals, including the bludgeoning death of the pigs making up their feast, which may prove disturbing for sensitive viewers. Dialogue is sparse, and the Pink Floyd soundtrack only appears in the background, rather than being used to drive the mood. La Vall�e is a visually mesmerizing examination of the often perilous pursuit for spirituality and human ideals. Image Transfer Review: Home Vision delivers a new, director-approved, anamorphic 2.35:1 transfer. N�stor Almendros' stunning cinematography comes across in rich, vivid colors, with lush greens and deeply saturated reds and blues in the tribal sequences. Fine grain is evident through much of the film. There is a hint of haloing on high contrast areas in select scenes, a bit of jagginess or aliasing on straight edges in places. Clarity is quite good for the most part, but some of the fine detail in backgrounds exhibit minor compression issues. The opening titles tend to bleed a fair amount. While there are defects here and there, the print is in very good shape all things considered. Noted on the packaging is the one major image flaw, which is a single tear followed by a frame roll at 19m:28s, both of which are but a momentary distraction. While not absolutely perfect or as pristine as one could hope for, this is such a major improvement to the only other version I've ever seen on home video, it is hard to really complain too much about it. Audio Transfer Review: The two-channel mono soundtrack is presented in its original mix of French and English. Any real issues are related to the source, and mostly pertain to the legibility of dialogue, which is sometimes obscured or fairly sibilant. For the most part this isn't an issue with the subtitles available. The Pink Floyd score&38212which interestingly features different arrangements than the soundtrack album�is noticibly on the quiet side, which again has to do with the original sound mix. From a quality perspective, I don't know what more I could expect with this. Extras Review: While the disc does have nice motion menus, the 14 chapter stops are about all there is in the way of on disc features. Given the obscurity of the title, I hadn't expected much in the supplemental department; my only real regret is not having the beautiful original poster artwork available. An essay on the film is included in the leaflet. There is no setup menu, and the subtitles defaulted to off on my player, so make sure they are on before viewing. La Vall�e elicits polarized reactions from its viewers. Audiences intolerant of irresolute endings or the languid pacing common to early 1970s films will be at a disadvantage, as the story unfolds at a measured gate, and concludes in an anti-climactic fashion. For those who can appreciate the spirit of its style and message, this is a long overdue reward, and will have them clamoring for More.